Dribbble is our inspiration site this week and I found this wonderful IMAGE. I love the collage of world images and the large world in the BG. I used a Tim Holtz die cut to cut the world and layered it on a DP. 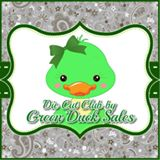 Then using some fun Green Duck embellishments from their new travel set I placed them around the world. I finished it off with the Tim Holtz travel word die cuts with the words Enjoy the World. Love how you arranged the die cuts on this card, Lisa, and used the big globe behind them. I've wondered about the Tim Holtz word dies, never knew if they were wide enough to adhere with a glue pen but they look it.